Molykote HP-870 is a fully fluorinated grease that provides outstanding performance in extreme environments. It offers outstanding stability at high temperatures and it is compatible with most rubbers and plastics. This material is be used broadly under harsh conditions such as high temperatures, solvent, corrosive, liquefied natural gasses, high vacuum and much more. The ideal use is for cardboard manufacturing equipment, semiconductor manufacturing equipment or other applications where evaporation of the lubricant can be an issue. Molykote HP-870 Grease is white in appearance and has a service temperature range of -20 to 250 degrees Celsius. It is NLGI class 2 and the density is 2.0 g/cm₃. This advance material offers minimal deterioration due to oxidation which allows it to be appropriate for long term lubrication. It is composed of perfluoro polyether, fluorinated polymer and a corrosion inhibitor. Evaporation at 200 degrees Celsius in a 24 hour period will be 1.0% per MIL-S-8660. Evaporation in the same temperature for 1,000 hours will only be 3.0%. The grease has low vapor pressure and will provide superior resistance to chemicals and solvents. When applying the grease, it is strongly recommended to clean the points of contact. Dow Corning Molykote HP-870 is highly chemically stable, but it will gradually begin to wear down at temperatures in excess of 250 degrees Celsius releasing toxic gasses. It can be applied by spatula, brush or automatic lubrication device. For more information in regards to Molykote HP-870, contact Krayden and a certified technical representative will assist you with any questions that you may have. Reading and understanding the Molykote HP-870 MSDS is strongly recommended before using. When this product is stored in its unopened container in a cool dark place, the usable life will be 36 months from production. It has not been tested nor considered suitable to be used for medical or pharmaceutical uses. Wash hands thoroughly after working with this product. 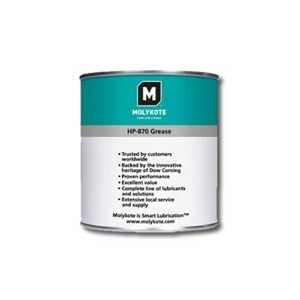 Molykote HP-870 Grease is available in different standard container sizes, contact Krayden and we can assist in finding the correct material size for your application. Molykote is a pioneer in developing advance lubricating and grease materials for a wide range of applications. Molykote HP-870 is an advance grease that bares environmental weathering while losing less than 3.0 percent at 200 degrees Celsius. It also offers minimal deterioration due to oxidation which makes it suitable for long term lubrication. More information about Molykote HP-870 can be obtained by contacting Krayden, a certified distributor of Dow Corning. More can be found on the Molykote HP-870 TDS.